Many of today’s commercial printers are feeling the pressure to offer more creative solutions to better serve their customers and win more business. As brands fight to win consumers’ attention, it’s no surprise that ads are becoming more creative and the competition tougher. Luckily, inkjet printing technology today is fast, inexpensive and versatile, allowing you to be creative with your offerings for printing outdoor ads. To help spark your creativity, here are three tips for helping your clients win consumers’ attention. In a recent blog post by Sign & Digital Graphics, Paula Aven Gladych explains that although digital billboards are becoming more popular, traditional billboards of all sizes and shapes are still more common. This is due in part to the low cost – a billboard graphic costs between 32 and 36 cents per square foot, whereas the cost 10 years ago was $1.50 per square foot. To make attention-grabbing billboards, advertisers and printers need to think outside of the two-dimensional, rectangular box. Consider incorporating mixed media, such as sculptures, into billboard ads. 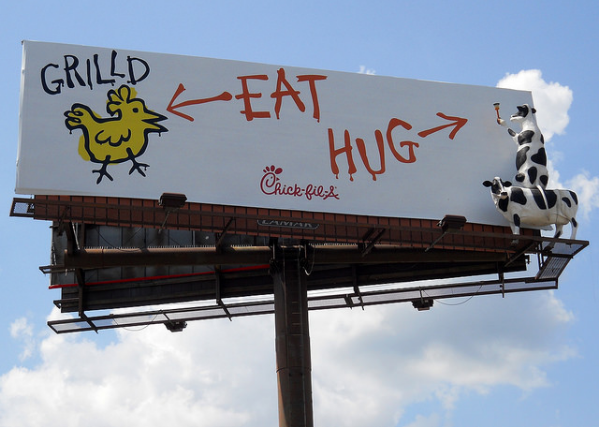 A well-known example: Chick-fil-A billboards typically include two cow sculptures that are “painting” a reason you should eat more chicken and less beef (see featured picture above). Another tip: Gladych suggests adding extensions off the sides of the billboards to make the billboard more interesting and eye-catching than the typical rectangular billboard. Outdoor concerts, fairs and festivals are increasingly popular and are great marketing and advertising opportunities. Vendors and advertisers can stand out from the crowd by covering a tent with custom graphics and featuring inflatable structures, which are in high demand, according to Gladych. Brands are continuing to embrace transportation and freight (semi-trucks, buses, taxis, barges, etc.) as advertising opportunities, and the most effective examples use optical illusions. For example, this Nike ad used a barge and shipping container to create the illusion of a man pulling on resistance bands connected to the barge. Semi-trucks are also great opportunities for creative advertising and many brands have already caught onto this. The trailers become moving billboards creating thousands of impressions every day. Want to learn more about inkjet printing technology to help you better serve your customers? Find information on our Uvistar Grand Format and Onset X Wide Format Series pages.